Such network will allow BRICS states better news and views exchange. A Network of BRICS Press Clubs was inaugurated in New Delhi earlier this month, weeks after the BRICS summit ended in Goa, with representatives from the five countries getting together to review the outcome of the leaders’ meeting and chart a course for the future. The latest among the BRICS initiatives to foster improved people to people contacts and increase awareness about other partners is the BRICS Network of Press Clubs, which aims to facilitate improved access to news about each other’s countries and create a real-time news-sharing arrangement among the five countries. 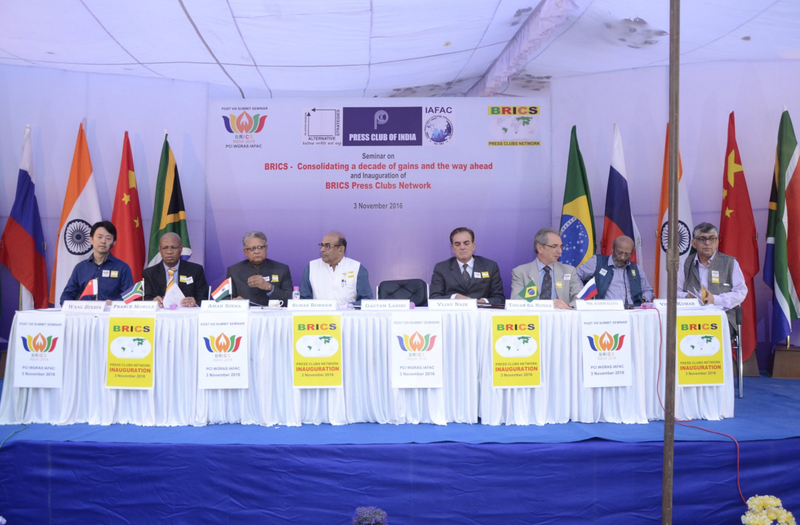 Ambassadors and senior officials from the five BRICS countries, Brazil, Russia, India, China and South Africa launched the BRICS Press Clubs Network on November 3 at the Press Club of India which, along with other leading media organisations in India, jointly organised the event. They also reviewed the outcome of the recently concluded eighth BRICS summit in a seminar on ‘Post 8th BRICS Summit,’ organised for the occasion. Denying media criticism that the Goa summit was a “unifocal” summit, only concentrating on counter-terrorism issues, Amar Sinha, Secretary, Economic Relations in the Indian Ministry of External Affairs, said the summit agenda was “forward-looking” and “wide-ranging,” reflected in the 93-paragraph long Summit declaration and Action Plan. Sinha said a great deal of the discussion among BRICS leaders was about enhancing economic ties within BRICS, where trade is lagging. The leading Indian negotiator and “sherpa” at the BRICS summit, Sinha said the Memorandum of Understanding (MoU) on Customs Cooperation was an important outcome. The MoU would lead to a trade facilitation agreement to promote trade between the five countries. “Clearly, contrary to predictions of doom, we are doing well as a group, because the (BRICS web) site has been hacked,” he said wryly. Lauding the launch of the Network of BRICS Press Clubs as “enabling improved relations,” Sinha said the governments would do whatever they could to facilitate the easy movement of media personnel between the five countries for “objective and improved dissemination of news and information” about each other. A similar network of lawyers was being discussed, Sinha disclosed, to facilitate arbitration and legal issues among the five nations of the group. This would help harmonise legislation within the group and give a boost to trade ties. Another issue under discussion was a BRICS mechanism to provide Marine Insurance. At the moment, only a couple of western companies control the global marine insurance market. “BRICS countries have a huge volume of shipping and maritime trade, so it is an area of interest for all of us,” Sinha said. Tovar de Nunes, Brazilian Ambassador to India, said the Goa summit had taken “concrete steps” toward consolidation of the group. “We do everything politically, as governments, to foster sustainable development,” Nunes said. Brazil, he said, would work to facilitate closer relations among media personnel, by making it easier for journalists to get visas. Francis Morule, South Africa’s High Commissioner to India, said he would urge media organisations in his country to actively participate in the Network of Press Clubs. His government would also take up the visa issue. Speaking at the launch of the Network of BRICS Press Clubs, which has received strong expressions of support from Russia’s National Union of Journalists, Sergei Karmalito, Senior Counsellor in the Russian Embassy in India, recalled how a similar effort was made in the 1980s, bilaterally between India and the Soviet Union. “At the Goa summit, we felt the need for closer relations between our journalists,” Karmalito said. “Organising a BRICS Press Clubs network will allow us better news exchange and exchange of views,” he said. “Usually we only see Western agencies reports on our countries. This will give us unbiased and multi-faceted perspectives about each other’s countries,” he said, adding that Moscow would help facilitate the movement of media persons for news exchanges. Reviewing the Goa BRICS summit, the Counsellor said, “just a strong anti-terrorist agenda would have been enough, but there was so much more” in the outcome. “Russia,” he said, “supports all Indian efforts to combat terrorism. Each country has the right to counter-terrorism against it,” Karmalito said.